OS grid ref: SJ 9111 0050. The well called Wulfruna’s fountain stands near the top end of Gorsebrook road, just after the railway bridge and beside what used to be the race-course (it is now a trading estate). A little further along and you come to the A449 flyover roundabout. Also called Lady Wulfruna’s Well, today it is more of a fountain; it used to have a tap and drinking cup, but these are now gone and no water flows here. The fountain, which was set up in 1901, was restored back in 1980 by the local Civic society after falling into disrepair at the hands of “mother nature”. Originally the well stood close by St Peter’s collegiate church where, in 994 AD St Wulfruna as she was later known, founded a convent dedicated to St Mary and endowed the first church. This place was later called Wulfrun’s Heanton (High Town) from which is derived the name of Wulfrun Hanton or, as we know it today, Wolverhampton. According to legend, Wulfruna was a noblewoman of the house of Mercia, possibly the grand-daughter of King Aethelred I. In 943 AD she was imprisoned by the Viking chieftain, Olaf, at Tamworth, but eventually she was released and in 985 King Aethelred II granted her land at a place then called Peoleshale (Pelsall). Her two sons Aelhelm and Wulfric became key-players in the royal houses of Northumbria and Mercia. Wulfric went on to found the abbey of Burton-on-Trent. A statue of Lady Wulfruna can be seen in the square close to St Peter’s Church in the town. A Roman column carved in the 9th century with Anglo-Saxon decoration stands by the south porch of St Peter’s. Lady Wulfruna (St Wulfruna) died at Tamworth in 995 or 996 and was buried there. The well water originally had healing qualities that were said to be very therapeutic with strong medicinal values. In the Middle Ages and, indeed, upto the Victorian age, faithful pilgrims came here in the hope of a miraculous cure. And no doubt they did receive a miraculous cure because the well continued to be in use for many centuries after. 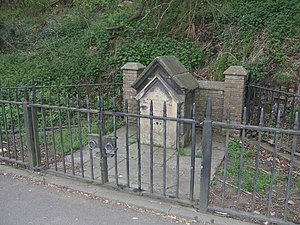 Categories: Holy Wells, Wulfruna's Well Wolverhampton | Tags: Wulfruna's Well at Wolverhampton in the West Midlands | Permalink.